A yellow perch will eat minnows. 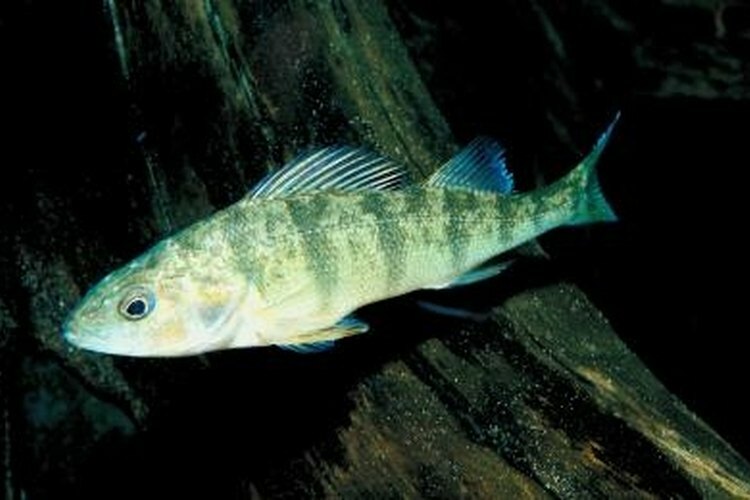 Yellow perch are carnivorous fish that prefer to ambush prey near the bottom of waterways. Their main foods consist of live insects, crustaceans, small fish and various other creatures. With the proper knowledge of the fish's preferred bait and how to use them, an angler can catch a significant number of yellow perch. Young yellow perch feed on phytoplankton, zooplankton as well as insects that swim within the water. As a yellow perch matures it will feed on larger prey. A good bait to attract both young and mature yellow perch is a mealworm, which is the young larva of a beetle. A successful method to catch yellow perch is to use a small floater, and several meal worms, about three to four, on a sharp hook. Cast your line into open water and let it drift. Eventually a yellow perch will notice the cluster of mealworms and strike. A crayfish is tiny crustacean that is no larger than 3 to 5 inches. It's part of a yellow perch's diet, and It inhabits the bottoms of rivers, ponds and lakes. Anglers intending to use a crayfish as bait, need to use a small float and two split-shots. A split-shot is a tiny metal "ball-bearing" weight that clamps to your fishing line. A split-shot allows an angler to cast farther out and keeps bait near the bottom. Hook the crayfish in the back of its tail. Cast a crayfish near a cluster of large rocks or around foliage and wait for a yellow perch to strike. Yellow perch prefer small fish ranging in size from 3 to 6 inches as food. They will go for silver and gold shiners wiggling at the end of a hook. Using flathead minnows in deep water will also yield favorable results. A yellow perch will strike just about any small moving target in the water. Anglers can use amphibians such as newts or salamanders as bait. Additionally, in cold weather or ice fishing, try leeches to catch yellow perch. Yellow perch strike a variety of artificial lures including minnow plugs, spinners and stream flies. When using artificial baits, select bright colors as these are more appealing baits to yellow perch. Consider colors such as white, yellow or red, which work well when fishing in murky and even clear conditions.